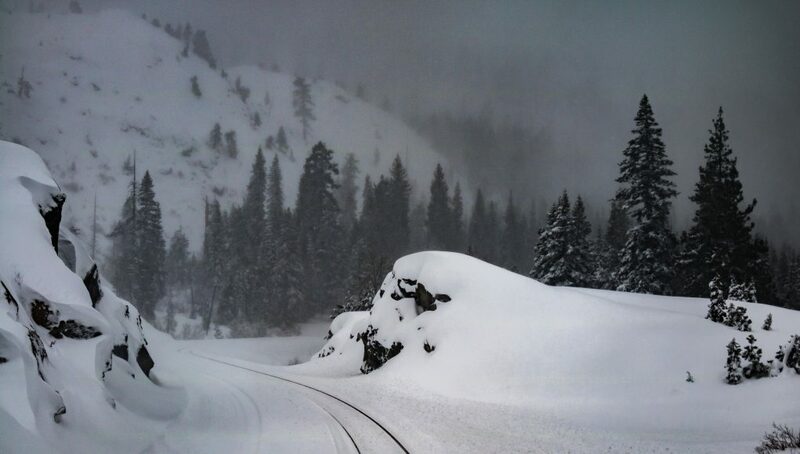 You can tell by the tracks that we were the first train to pass over the snow-covered rails. 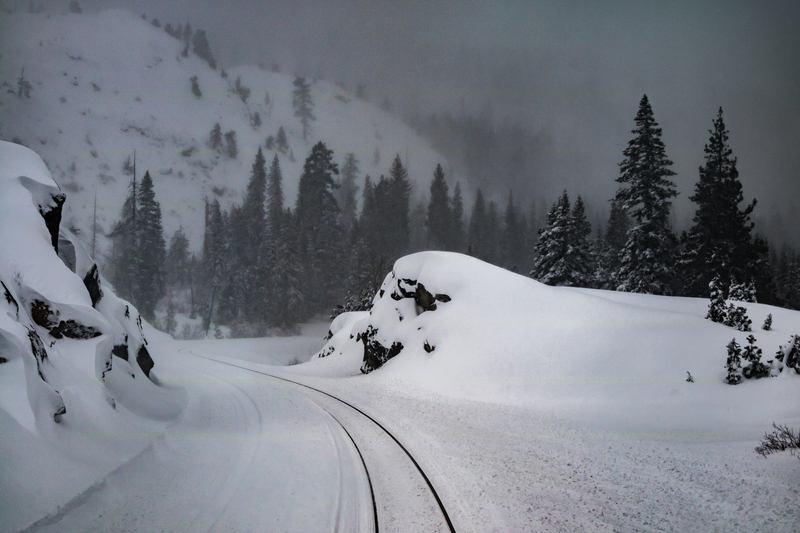 I love the history of the construction of the original railroad route through the Sierras from Sacramento to Reno and I have always wanted to see the route when it was covered with snow. I had been watching the weather for an opportunity and one weekend at the beginning of March the forecast called for a major precipitation event to blanket the Sierras with heavy snow. I booked a ticket from Emeryville to Reno on the California Zephyr, which runs from Emeryville to Chicago. That first leg takes you up the original route that was carved through the mountains as part of the race to build the transcontinental railroad during the 1860s. The Amtrak station at Emeryville is very close to sea level. That morning, there was a deep overcast and intermittent heavy rain. Five hours later, the train was plowing through a blizzard that wound up dumping almost 3 feet of snow up where the train travels. It was just as amazing as I had hoped it would be. That day, passengers headed for Reno were assigned to the last car on the train, which turned out to be perfect for me. I was able to stand at the rear door of the car and take photos out to the rear, with clear tracks behind. Along the Bay coast at Pinole, near Wilson Point. As we started to rise out of Sacramento up into the mountains, we could see that the rain had been heavy. Leaving a tunnel in the Sierra. The snow had been so heavy and there had been so little wind that the snow was still hanging in the trees. Leaving one of the snowbarns high in the Sierra. Another train had gone by, exposing another set of tracks bending around a curve. Entering one of the snow barns up in the mountains near Donner Pass. Passing under I-80 at Yuba Pass in the snow. How cool is this? Look how steep that slope is. The snow had been falling for several hours when we finally arrived at Truckee. Previous articleSigns of impending change?